She (Hwang Su-Jeong) has suffered from violence by her husband for a lengthy amount of time. She is diagnosed with a fatal disease and learns that she doesn't have much time left to live. The woman decides to set out on a trip. On her trip, she meets him and fall in love. He (Ki Tae-Young) was sentence to life in prison for killing his father. While in prison, he was able to escape. He meets the woman. He was only full of anger before, but experiences a change because of her. He begins to have dreams and hopes. 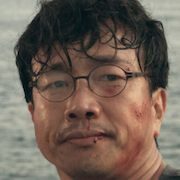 Song Jang-Soo (Park Chul-Min) stands on a cliff and is about to end his life. He becomes thirsty, but there isn't a place to get some water. He finds a lighter with a phone number for a dabang coffee shop inscribed on the lighter. He calls the shop and asks for some water, but the delivery girl doesn't arrive. He decides that he can't die like that and he will get water from her and then die.